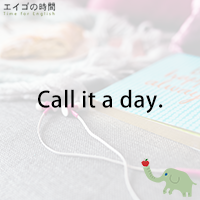 Today you’ll learn how to use the idiom “to call it a day” in your conversations. The idiom “calling it a day” means to stop doing whatever you’re doing for the rest of that day, whether or not it is completed. Let’s say. I’m translating a legal document. It’s only five but I’ve been working on this since eight o’clock in the morning. I’m tired. I’m a bit hungry too. So I’ve decided to call it a day. In other words, I’ll stop now. I’m done for the day. Call it a day or call it a night. It’s a good expression to learn. So add it to your phrasebook. In the meantime, why don’t you try a quiz? I’ll read three sentences. Please listen carefully and choose the one that is TRUE. Ready? 1. it’s time to take a short break. 2. it’s time to eat dinner. 3. it’s time to stop working and go home.